Two pairs of symbolic guardians sit at the east and west entrances of the Capitol. The original lions, sculpted in 1915 by Gavin Jack, had been made out of cement—a medium that proved vulnerable to corrosion. The lions were repaired for weather damage in 1977 by local artist Ralphael Plescia, but a thorough examination of the lions during the 2004–2008 Capitol restoration project concluded that weather had deteriorated the sculptures too much for a second repair. New lions were sculpted from Italian marble by Nick Fairplay, master carver. 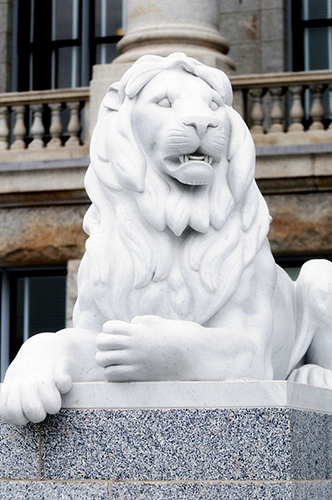 Italian marble, a very durable medium, was chosen in order to extend the life of the Capitol’s new lions. These lions have been given the names of honorable virtues: Fortitude, Integrity, Honor, and Patience. Each lion was sculpted to represent a different age of life.